Thousands of loads of laundry over many years and I was sure that without my beloved drier sheets my clothes would come out full of static electricity and be stiff and uncomfortable to wear. In all honesty I never thought about not using dryer sheets until my then boyfriend now husband and I moved in together and he strongly protested dryer sheet/fabric softener use. He claimed that he hated the film and feel of his clothes after they were dried with dryer sheets. I thought he was being a bit dramatic, after all a lifetime of dryer sheet use kept the static electricity out of my hair! As time went on he finally won me over to the no dryer sheet crowd. I can attest that since changing our lifestyle and getting toxic chemicals out of our home my sinuses have stopped running constantly and I feel much better. The good news is that we use toxic free laundry soap and no fabric softeners or dryer sheets and I do not suffer from static electricity in my hair or home! 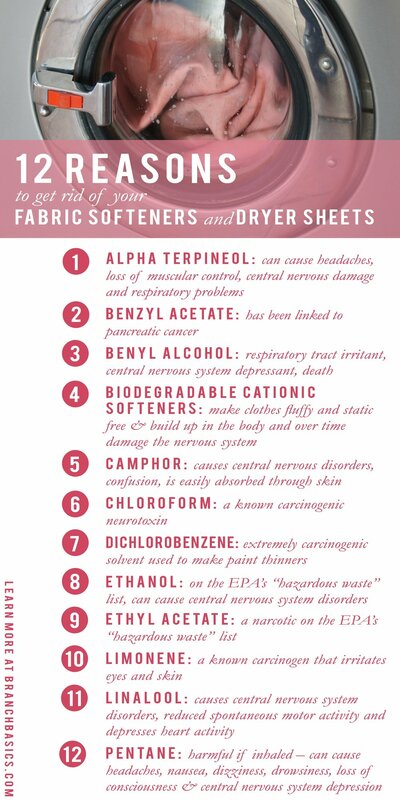 As a non-toxic alternative to fabric softeners and dryer sheets try using wool dryer balls. They soften laundry, reduce static, and shorten drying time. You can buy ready-made balls or make your own with wool batting or wool yarn.